Let me start by saying I’ve been listening to Cory Asbury since his early days at IHOP in Kansas City. I’ve led a handful of his songs over the years at churches, night watches, David’s Tent in Washington DC and in other settings. So my opinion here is not based in anti-Asbury bias or any other sort of spirit-led, harp and bowl or generational biases. Those settings are my wheelhouse as a worship leader, musician, songwriter and worshiper. I should also say that I’ve read Cory Asbury’s explanation of the term “reckless” as used in his song “Reckless Love.” And I’ve read the justification explanation of the song’s use of the word “reckless” by the litany of its apologists. Essentially they all say the same thing. “God Himself is not reckless. But he chases after us with reckless abandon for His own safety.” What safety are we referring to? Is God not safe in everything he does? Is there anything that is a threat to God’s safety? I’ve also seen people use this logic: “It’s starting a conversation and that’s a good thing.” In Christendom I don’t think the terms “any press is good press” or “it gives us something challenging to talk about” applies. Where were those people when Rob Bell’s book Love Wins was released? When Bell suggested maybe we are misinterpreting the Biblical definition of Hell (Gehenna) he was called a heretic and ridiculed by many. But we can call God “reckless” and that’s ok. I don’t understand the logic. Using a negative word to describe God’s goodness and love for us is irresponsible or dare I say “reckless.” Asbury has spent 12 months explaining his use of the word “reckless” and that in itself is a problem. Have we reached a point in our Christian living where words like relentless, amazing, incredible and awesome are no longer good enough words to use to describe God’s character? This is the bigger picture for me. There’s seems to be a growing need for people to find more clever, uber-smart and catchy ways to describe God, as if “awesome” doesn’t cut it anymore. God is so far beyond “awesome” that He’s “reckless.” Is that the point? There are literally thousands of synonyms for the words awesome, relentless, great and incredible. Thousands. And all of them have positive connotations. What are some of the synonyms “reckless” you ask? Careless, ill-advised, negligent, foolhardy, harebrained, hotheaded, kooky, mindless and rash to name just a few. Back to the big picture for a moment. I believe there’s a fear that has set in for many Christians. It’s manifesting itself in a defensive posture that many are taking when we have discussions about things like the lyrics of Reckless Love and Love Wins by Rob Bell. I don’t for a second believe Cory Asbury thought he was being controversial when he wrote the song’s lyrics. His heart comes through in all of his songwriting. It’s ok to see the word “reckless” for what it really is and for its misuse in this song. It’s no reflection on a good man’s character to have gotten this one wrong. If we can drop the defensive positioning and bunker mentality for a second it’s clear that “reckless” is a poor way to describe the Most High God. “Relentless Love” would convey the exact same meaning as what “Reckless Love” is trying to convey and it would do so in a manner that would not cause division and confusion. It would sing the same, sound the same and no 12 months of explaining would be necessary. Our God is relentless. He’s not reckless. As a worship leader, singer, musician, worshiper and songwriter I will choose to err on the side of solid theology and Biblical correctness over cleverness, trendy and hipness every time. 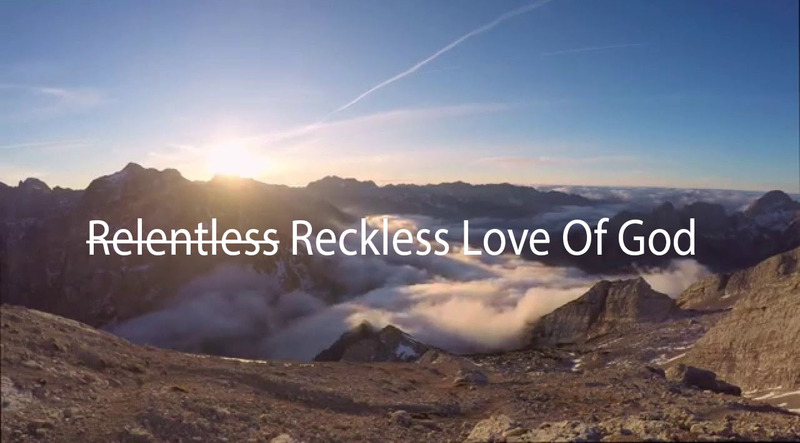 We wouldn’t teach that God is “reckless” so why would we sing it? Amen and Amen! Really all it takes is some terminology research to understand that the word choice ruins the entirety of the song. I had one person say that he purpose was not to focus on the “reckless” word. However, the fact Cory named the song “Reckless Love” gives me the impression that reckless was the core of the message. I had written my take on the song as well. https://www.onewaygospel.com/is-gods-love-reckless/ We are on the same page here. Great Work!